Buy 2 – $39.95 ea. — FREE SHIPPING! Buy 3 – $29.95 ea. — FREE SHIPPING! Temporary Introductory Sale – Buy 1 for $29.95 ea. No Free Shipping. PLUS – A FREE 15-min consultation (phone or email) regarding your test results! The PURIFICATION TEST STRIPS have been under development for many years. I have always been interested in the basics of achieving a healthy longevity. There are 4 key aspects of living long and healthy and these strips measure them. Once you learn how to properly interpret them you can test yourself at least weekly and use the feedback from your body to know exactly what you need to be doing regarding your (A)ttitudes, (B)eliefs, (L)ifestyle and (E)nvironment (ABLE) to keep yourself healthy, successful and happy. 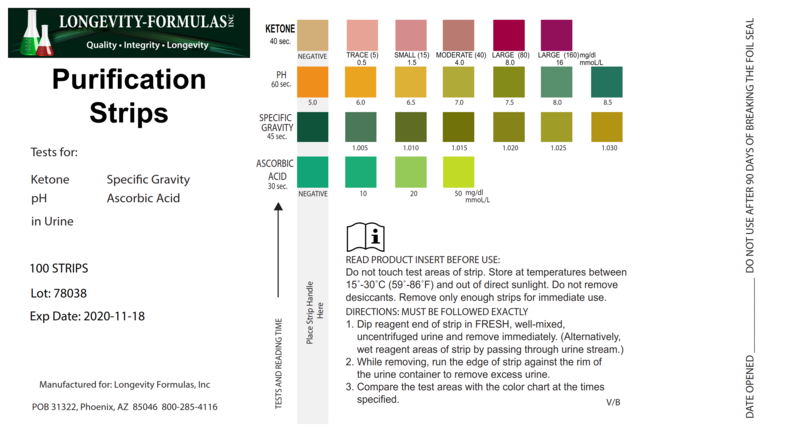 Ketones — This is a urine test. When carbohydrates are consumed they are converted into glucose which is the body’s primary energy source. When glucose is not available the body breaks down fat stores for energy (ketones). The ketogenic dieter consumes high levels of fat in order to provide energy to fuel the body’s processes because carbohydrates are not being consumed. Ketones become the body’s primary energy source while on the ketogenic diet. Having this pad be as dark as possible means that you are becoming a fat-burner, which is what you want to be if you are trying to lose or maintain weight and/or gain better control over blood sugar. 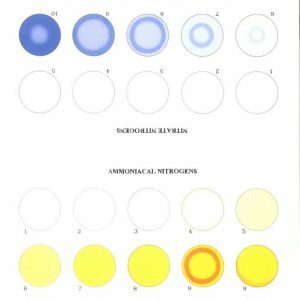 pH – This is a urine and saliva test. This pad allows you to test your urine pH and saliva pH to help ensure that you are in the best of health. Use one strip for urine and another for saliva. Your urine pH should never be higher than your saliva pH. Your urine pH should never be above 6.8. Your Saliva pH should never be below 6.5. The total of your two pH’s should be very close to 12.8. The spread between the two pH’s should be no more than .5 points (ex: 6.2 / 6.7). If your results violate any of the above you need to contact my BIRI office, 888-221-4116, immediately. 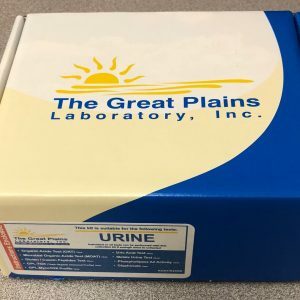 Specific Gravity – This is a urine test. This pad will allow you to see if you are consuming enough pure water for your body weight. How do you know if you are consuming enough pure water for your body weight and lifestyle? Urine Test Strips are a simple, inexpensive way to get necessary feedback to create a healthy lifestyle. If you have a health problem, suspect FIRST that you are/have not been drinking enough pure water for your body weight. Health is SIMPLE, folks! Not enough oxygen going to your cells is the CAUSE of cancer and lot of other problems much less threatening. Got a problem? Make SURE you are drinking enough pure water (preferably IonPod® water with BioVitale-H2O® added). The Urine Test Strips will help you determine if you are drinking enough water. You should test at the 1.010 to 1.015 specific gravity level MAXIMUM. If the reading is higher than 1.010, you are likely not consuming enough pure water for your body weight or you are consuming too much water too infrequently for your body weight or lifestyle. Improper water intake or the wrong kind of water is the #1 health problem in America. Monitor your entire family at least weekly. Read “Your Body Cries For Water” available from Amazon.com. 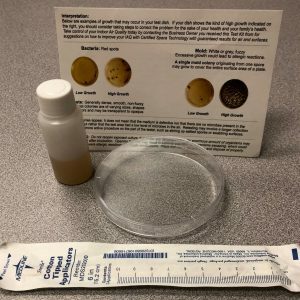 Chances are, after spending 1 week making sure that your urine specific gravity is 1.010, you will notice that whatever “problem” you thought you had is MUCH better! Vitamin C – This is a urine test. Vitamin C is vital for health and longevity. I recommend testing your urine vitamin C status regularly and take enough vitamin C or drink enough 10% mix lemon water daily to test well beyond the 50 level. You want that pad as light as you can get it. The benefits of adequate vitamin C are many. The bottom line is that you cannot be well if you do not have adequate vitamin C in your body. Use those test strips 3x weekly, same time of day. Test yourself at the same time of day at least weekly by dipping the test strip into your urine. All of the pads should be monitored by every member of your family. Test both at least weekly always at the same time of day. These items, which can be self-tested, are some of the most important tests that each human being should be performing at least weekly. It will save you thousands of dollars in medical bills and help you live a long, healthy life. 100 Strips.